The MultiHarp 150 is an easy-to-use, plug-and-play multi-channel event timer and Time-Correlated Single Photon Counting (TCSPC) device. Its extremely fast signal processing leads to an excellent data throughput via USB 3.0 interface. The MultiHarp 150 is a compact, robust and reliable device whose high quality is reflected by our unique 5-year limited warranty. Two MultiHarp 150 models are available with either 4 or 8 identical detection channels with 80 ps resolution, which are synchronized but independent. Each model features also one common synchronization input. All channels including the sync input can be used as detector inputs, e.g. for coincidence correlation or coincidence counting. The MultiHarp 150 is also ideally suited for performing TCSPC with multiple detectors using forward start-stop operation. Here the common sync channel allows for synchronization with the excitation source. The smartly designed timing electronics allows to fully exploit the count rate limits of time-correlated single photon counting, without having to compromise on the time resolution for many modern single photon detectors. The ultra short dead time of 650 ps allows detecting multiple photons per excitation cycle even at the highest repetition rates achievable by modern picosecond pulsed lasers (requires a detector from the PMA Hybrid Series). Each input channel has internal adjustable timing offsets with ±100 ns range at 80 ps steps. This greatly simplifies the cabling requirements for experimental set-ups, as selecting cable lengths to compensate for signal delays is no longer needed. The Time-Tagged Time-Resolved (TTTR) modes supported by the MultiHarp 150 record all relevant time and channel routing information of each detected individual photon event. By storing this full data set, it becomes possible to carry out the most comprehensive and sophisticated analysis of photon dynamics after a measurement. A real time data correlator is included to monitor FCS experiments at count rates of up to 1.000.000 counts/sec. Furthermore, the MultiHarp 150 can be synchronized with other hardware such as scanners when operated in TTTR mode. White Rabbit is a fully deterministic, Ethernet-based timing network which provides sub-nanosecond accuracy and precise synchronization of devices over large distances. Thanks to its White Rabbit interface, the MultiHarp 150 is prepared to be used in networks that are based on this emerging technology. The MultiHarp 150 comes with a Windows software package that providing all important functions such as setting measurement parameters, displaying results, loading / saving of measurement parameters and measurement curves. Important measurement data, including count rate, count maximum, position and peak width are continuously displayed. A comprehensive online help system eases the user into fully employing the capabilities of the MultiHarp 150. A library for custom programming, e.g., with LabVIEW is also included. PicoQuant is committed to the support and development of this software and upgrades with extended functionality will be made available. This is the initial release of the MultiHarp 150 software. Pulse width 10 ns typ. Baseline level 0 V typ. Active level (pulse peak) -0.7 V typ. Measurement of the accumulated events as a function of time, manually started, stopped manually or upon overflow or expiration of a chosen collection time or upon reaching of a defined number of counts. 512 curves with up to 65536 time channels, more than 4 billion counts per time channel (32 bits). Repetitive measurement and on-line display, very useful for optical alignment. Flicker free histogram display updates and large rate mete. Continuously recording events without onboard histogramming straight to disk. Together with the channel number the arrival time of each event with respect to the beginning of the experiment is recorded for ultimate flexibility in offline data analysis, e.g. in single molecule detection and Burst Integrated Fluorescence Lifetime (BIFL) measurement as well as time-resolved FCS, coincidence correlation (antibunching, etc.) or time-interval analysis. 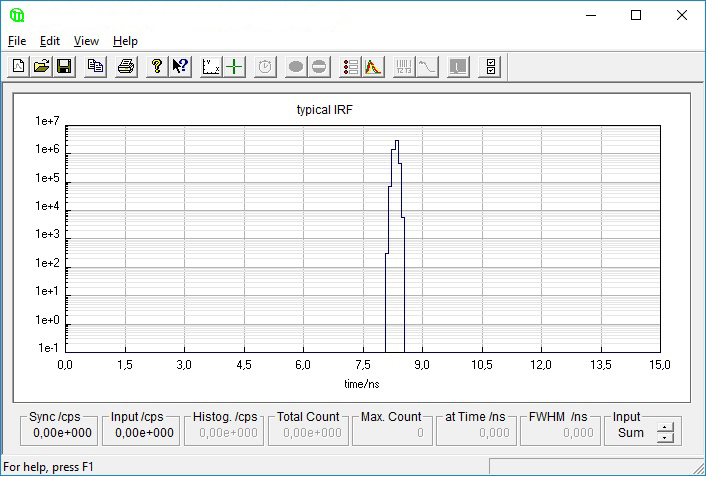 A real-time correlator is included in the TTTR mode which can be extremely useful in setting up and monitoring of FCS experiments. Fast transfer and a large FIFO buffer allow huge count rates without any loss of data. Up to four different external synchronization signals (“markers”) can be fed into the data stream and allow to synchronize the data acquisition with external hardware such as scanners for Fluorescence Lifetime Imaging (FLIM). The MultiHarp 150 software allows the control of all measurement parameters provided by the MultiHarp 150 module. The input channels are programmable for a variety of signal types. All functions of the system are controlled by a software interface for Windows 8 and 10. The software provides functions such as the setting of measurement parameters, display of measurement results, loading and saving of measurement parameters and measurement curves. Important measurement characteristics such as count rate, count maximum and position, and histogram width (FWHM) are displayed continuously. A comprehensive online help function shortens the user's learning curve. Software upgrades for extended functionality will be available with further product development. A library (DLL) for custom program developmen is also provided and allows building your own applications, e.g., in LabVIEW , C++, Delphi or Matlab. Demo code is provided for an easy start. A Windows as well as a Linux version is available. The libraries are API compatible, so that applications can easily be ported between the platforms. Time-Tagged Time-Resolved (TTTR) mode allows the recording of individual count events directly to hard disk or computer memory. The timing of each photon is captured as an event record without any early data reduction (such as on-board forming of histograms). This mode is particularly interesting where e.g. the dynamics in a fluorescence process are to be investigated in depth. The availability of the full timing information permits photon burst identification, which is of great value e.g. for single molecule spectroscopy in a liquid flow. Other typical applications are Fluorescence Correlation Spectroscopy (FCS) and Burst Integrated Fluorescence Lifetime (BIFL) measurements. Together with an appropriate scan controller, TTTR mode is also suitable for ultra fast Fluorescence Lifetime Imaging (FLIM) with unlimited image size. Applications beyond fluorescence spectroscopy are e.g. time interval analysis, quantum optics and related basic rearch. The MultiHarp 150 actually supports two different time-tagging modes, T2 and T3 Mode - a concept originally introduced with previous products of the Harp series. They differ slightly in their use of the input channels. By using the suitable mode, a very wide range of applications can be covered. In T2 Mode all signal inputs of the MultiHarp 150 are functionally identical. There is no dedication of one channel to a sync signal. All inputs can be used to connect photon detectors. The events from all channels are recorded independently and treated equally. In each case an event record is generated that contains information about the channel it came from and the arrival time of the event with respect to the overall measurement start. If the time tag overflows, a special overflow marker record is inserted in the data stream, so that upon processing of the data stream a theoretically infinite time span can be recovered at full resolution. Dead times exist only within each channel but not across the channels. Therefore, cross correlations can be calculated down to zero lag time. This allows powerful new applications such as FCS with lag times from picoseconds to hours to be implemented with one instrument. Autocorrelations can also be calculated at the full resolution but of course only starting from lag times larger than the deadtime. The T3 Mode is specifically designed to use periodic sync signals from pulsed lasers with high repetition rate up to 1.2 GHz. This signal is connected to the dedicated sync channel. As far as the experimental setup is concerned, this is similar to classic TCSPC in histogramming mode. 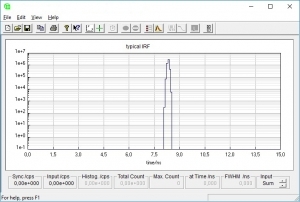 In addition to the picosecond start-stop timing, the channel number is recorded and each event is time tagged with respect to the beginning of the experiment. The time tag is obtained by simply counting sync pulses. From the event records in T3 mode it is therefore possible to precisely determine which sync period a photon event belongs to. Since the sync period is also known precisely, this furthermore allows to reconstruct the arrival time of the photon with respect to the overall experiment time. If the counter overflows, a special overflow marker record is inserted in the data stream, so that upon processing of the data stream a theoretically infinite time span can be recovered. The MultiHarp 150 supports capturing up to four external marker events in the TTTR modes that can be fed to the instrument as TTL signals via a suited SubD connector. These events are recorded as part of the TTTR data stream. This allows to precisely synchronize the TTTR measurement with almost any experiment. The most important applications of this feature are FLIM and FRET imaging. This concept is used in the cutting-edge time-resolved microscope MicroTime 200. The acquisition software provided with the instrument comes with a rich set of demo programs that enable users to write their own analysis and display programs for TTTR data. Users who prefer to use standard data analysis algorithms out of the box may want to consider the powerful SymPhoTime 64 software suite. It implements a wide range of state-of-the-art analysis algorithms for FLIM, FCS and FRET to name only a few.